The anarchists were reflex to an evil history which penetrated their own remarkable and macabre achievements. In their efforts, the state was countered by the dissolution of the state, centralization by decentralization, elitist intellectualism by pedestrian peasantism, force by reason, obedience by disobedience, familiar entropy by ordered familiarity. They had failed to free themselves, to disengage meaningfully from the existential boundaries and force of their own experience. They were (and are) forever in the state clawing out to a thing perceived through the eyes of naïve, desperate infancy. In the early twentieth century pamphlet “The Principles of Anarchism,” Lucy Parsons condenses the case for anarchism into a single, smoldering sentence: “So many able writers have shown that unjust institutions which work so much misery and suffering to the masses have their root in governments, and owe their whole existence to the power derived from government, we cannot help but believe that were every law, every title deed, every court, and every police officer or soldier abolished tomorrow with one sweep, we would be better off than now.” The language she employs herein indicates the contours of this program. Couched in the first-person plural, the “we” who do the believing and the “we” who reap the benefits are contiguous formations, a grouping held together by a having been knowing, an epistemological certitude (as it can’t be helped), that has only yet to be molded into the advocation of announcement. She gracefully strips away the veneer of the lie of abolition by fiat, for no legislation can negate its own authority to legislate, no freedom but that political freedom (that really is no freedom but a freedom to find stricture in the structure of the political as such) gets decreed. Parsons does not suggest an exercise in idealism as there is no telos to be found nor utopia to be gained. There is just a simple preconditional. If those laws, deeds, courts, cops, and soldiers were abolished instantaneously by the “we” who exist as the acted upon predicates of these institutions (a flipping of the script), “we would be better off than now.” Parsons does not promise the grand arrival of a new ontology derived from a post-revolutionary (dis)harmoniousness; she simply states that this abolition would bring on the “better off than now.” That broad political spectrum which writes off anarchism as the wildest of all impractical fantasies would be hard pressed to find a more tangible end goal than this dictum. “Better off than now” is that revolution as rolling back, a place to collectively start from rather than end up. “Better off than now” is the best we got. As for the new forms of life which will begin to germinate in a revolution on the ruins of the previous forms — no government will ever be able to find their expression as long as these forms do not establish themselves in the work of reconstruction by the masses being done at a thousand points simultaneously . . . We cannot legislate the future. All that can be done is foresee the essential tendencies and clear the way for them. That is what we are trying to do. Kropotkin’s anarchism merely argues for the procurement of the means necessary for the flourishing of a mutually held potentiality, one he necessarily cannot fully give shape to as its incompleteness ensures that the experiment is on track, not already foreclosed. This openness accounts for his most enduring successes as a theorist (the emphasis on the ability to feed and house revolutionary participants during an uprising to ensure its ongoingness as well as its creative vitality) and his greatest failures as an author (the repetitive compulsions a product of the very unwillingness to say exactly how life will play out sans capitalism and the state while always needing to advocate for the importance of this removal). Here we find the double bind Cedric Robinson’s above epigraph inevitably leads us towards, those experiential boundaries of an antithesis (mis)identified which marks the entirety of the nineteenth century anarchist thought with an unbridgeable impasse, a vision which in its very clarity obscures the full sensorial scope of the problem. Kropotkin continually identifies those kernels of the could have beens, the historical upswings of an excess that threatened to spillover into a totality of refusals bursting from the wellspring of an improvisatory communism (the “anarchy” of the title); he cannot, however, develop an epistemological bedrock from which to cast a reconceptualization of how the social can be known and lived in anew, instead falling back on the “science” of the title to justify his own rather straightforward empiricism, that modality which he steadfastly refuses to refuse. 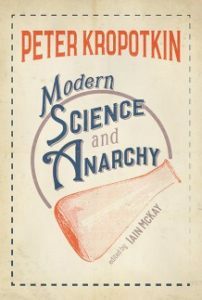 Modern Science and Anarchy deserves to be read, if only to briefly inhabit the intoxication of Kropotkin’s hope, one that reminds us that we do in fact already know what to get rid of to be better off, that this knowing alone is a lot.